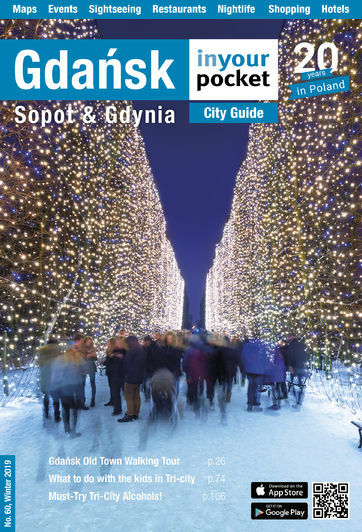 As more people discover the cities of Gdansk, Sopot and Gdynia, so the things on offer for them continues to improve. Once upon a time it was enough to simply open a bar, café or restaurant to get into Gdansk In Your Pocket. Nowadays, the standard of places already in the guide mean a new place really needs to make a mark to make it into the print guide (a copy of which you can download here). This issue has seen a bunch of new places make the grade, while others join the extended selection you’ll find here on our website. Take a look, and let us know what you think of those that made, and did not make, the cut. One of the attractions of visiting Gdansk is that you don’t just get the city of Gdansk. You get Sopot, Gdynia, Malbork, Frombork, the Hel Peninsula, the Kashubia region, the list goes on and on. There is now a wide choice of places that are ready and eager to serve you, the visitor. Visiting at this time of the year (this issue covers the winter and early spring) means that the competition for your business is fierce and therefore you not only miss the crowded streets of high-season but you get that extra time and attention that maybe aren’t available in summer. Enjoy it - we tend to enjoy these quieter moments of the year ourselves, even if the weather is not as cheerful. Also we would like to point you towards an ever increasing ‘What’s On’ section which we hope will help you entertain yourselves with while you are here and which you can also access via our app (available on IOS and Android now). Enjoy your stay and, if that’s your thing, follow our blog. You can also find us on Facebook, Twitter, Instagram and Tumblr. Of course we're always glad to hear your thoughts on the city, the guide and whatever else on poland (at) inyourpocket.com. You'll find links to all of the above and more at iyp.me/go-poland.